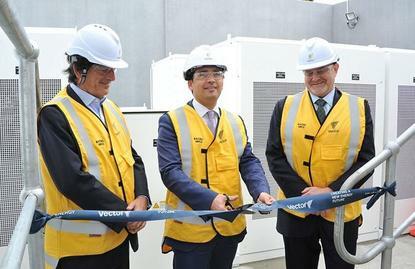 Vector CEO Simon Mackenzie (right) unveiling Asia Pacific's first grid-scale Tesla Powerpack last year. Auckland energy network company, Vector, has secured exclusive Australasian rights to "Internet of Energy" (IoE) technology from Israel-based mPrest. Vector CEO, Simon Mackenzie, said the addition of mPrest takes Vector's development of customer solutions and network management to a new level. Powered by artificial intelligence, the mPrest software positions Vector to enable customers to generate, store and manage energy use in their homes and businesses. “It is the most comprehensive monitoring, analytical and control system available anywhere in the world," he said. "We have worked with mPrest to trial it and we are now moving to full implementation." The software sits over customer, market, distributed energy resources and network systems managing performance in real time. Through self-learning, it is able to assess and predict multiple factors including loads, market dynamics, storage, customer demand and capacity, Vector said. "This greatly enhances the resilience, security and efficiency of customer solutions and our network," he added. The utilities sector is characterised by many unconnected, legacy-based systems from various vendors and operating to different standards, mPrest explains on its website - these include Ethernet, SCADA, OPC, ONVIF and MODBUS). Each typically covers a particular area of activity, such as temperature, pressure, noise, alarm and access control. This makes it difficult to create a coherent, cross-organisation picture and to make operational decisions. For mPrest CEO Natan Barak, the system aligns with Vector’s vision of "creating a new energy future" for its customers. “Vector customers will see innovative solutions whilst these are coordinated in a complex system," he added. "The company will be better able to assist customers capitalise on new energy technologies and optimise the energy use in their home or business." The project was a product of a New Zealand Innovation Mission to Israel last year. Vector also recently acquired home heating company ECo Products (HRV) and PowerSmart.